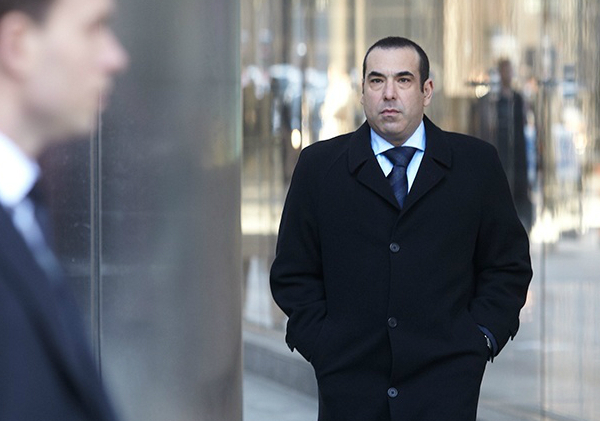 Rick Hoffman, best known for his roles as Patrick Van Dorn in “Jake in Progress” and more recently as Louis Litt in USA Network’s legal drama, “Suits,” sat down with CableTV in an exclusive interview and said the season three finale is surprising and will setup a brand new story line for season four. Q: It’s very rare and difficult to maintain the line between being a character that is not necessarily the nicest guy, but loved at the same time. How are you able to accomplish this so seamlessly? Hoffman: I think any character on television can become a human being when he has been on air long enough, especially when they introduce him when the time is right. By the stroke of some luck and in a funny situation they put me in and I take on the character and Aaron [Korsh] took on this character that kind of grew into this guy is very flawed, insecure, but very loyal and innocent in some strange way. In the combination of all of those, it’s makes him into this likable, hateable kind of like a lot of people out there. Somewhere deep down, he is kind of harmless and just foolish in many, many ways. As an actor, its never easy to portray all the time because it’s a challenging job, but it’s a gratifying one. Q: There is a lot of humor in the show ,of course, because you are balancing out the drama and the seriousness of all the cases and characters. You have some of these best lines on the show when it comes to comedic timing. Some of your scenes are so hilarious, I don’t know how you keep a straight face, like with that mudding scene. Hoffman: Thank you. I think it has to do with sticking to making sure this guys innocence. Everyone in the world they thinks they are doing the right thing all the time. They just think they are just dandy. This Louis character, as much as he thinks for the most part, mudding is just something that people do. It’s the norm. Some people take people to a basketball game to woo a client or to woo someone, Louis likes to take someone mudding. That’s of course just the writing. But always playing him innocent is the key. Most people are the hero of their own story and that’s where it comes from and I guess that’s where it comes from. Q: Your character seems to go back and forth with Harvey. Sometimes you are on the same team and other times you are fighting with one another. I don’t know which one is better. Hoffman: They are polar opposites. but what makes their dynamics so interesting is their motors are based on similar things. They are based on fear and insecurities. Harvey is just so smooth and polished and cool. Louis can’t hide it like Harvey does and of course they are polar opposites, but that’s where they are different. As far as what makes them run is loyalty and running on their insecurities and fear which is what makes them so interesting. Q: As I am watching the third season I notice that slowly but surely everyone is finding out that Mike is a fraud. What can you tell me about the rest of the season? Hoffman: Well, you know he is lied to again. He doesn’t really find out even though he has an idea. The repercussions are much more dangerous if he was ever on the trail again and it would be a much more deeper catastrophic result. So, it’s better that he didn’t find out that Mike is a fraud and didn’t go to Harvard. As opposed to just Mike, he would find out that the entire firm, which he considers his family, has been lying to him this entire time. So it’s kind of scary. So me personally I don’t want him to find out. If it happened, life as we know it would be Armageddon. Q: How has Louis changed up to this season? Hoffman: Well he has definitely begun looking inward and has slowly evolved from season one. I mean he isn’t a completely different person and hasn’t changed a ton. He is evolving with a limp. Q: Mike is realizing everyone is finding out what is going on, or he is having a hard time hiding it. Is that something we are going to see lead into season four? Hoffman: Well, based off this finale, we will be seeing a big question mark for Mike. He knows his ceiling and he knows it can’t be erased. It seems like he has in the finale so as of now it’s okay but I think with what’s to come in the finale who knows, but who knows. The last episode of the season will answer certain questions for certain people who care about that story line and others might feel like oh it ended too abruptly. We will see. Q: What can fans look forward to in the last episode and is there anything you know yet about season four? Hoffman: I can tell you based on what happens in the last episode and what we are shooting in the fourth season, all I can say is the writers do not repeat themselves and if people enjoy “Suits” like I do they are just going to enjoy it more and more because we have just been so lucky with our writers. Yeah, it’s just a lot of bold choices. Lets just put it that way. I am excited. A new season of “Suits” starts this June.